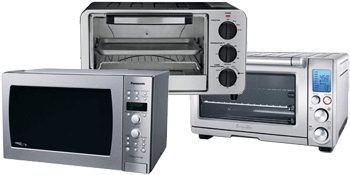 As with all electrical appliances you do need to be aware of the precautions, and microwaves certainly have plenty of them. In fact, I would go so far as to say that this is one kitchen “gadget” where the manual is vitally important. Even the most basic microwaves will come with a manual and my advice is you should read it, even if it’s just the safety information. To make things a little easier for you I decided to add this page so you have a quick reference on some of the major “don’ts” with a microwave. Lots of microwavable foods such as ready meals come in their own containers which are safe to use, but you should always read the information given on the packaging. For instance, you may need to remove some of the wrapping or pierce holes in plastic so the food inside can cook properly and won’t explode! When you’re using your own dishes glass is best but there are various kinds of cookware you can buy made of other materials that are microwave safe – just make sure you check first. 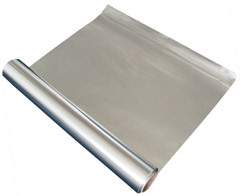 There is information out there that tells you it is possible to use aluminium foil in a microwave but I definitely wouldn’t recommend it. The reason for this is there are so many precautions surrounding using foil it would take you longer to make sure it’s being used safely than it would to cook your food! With this in mind, it goes without saying that you really shouldn’t use any type of metals in your microwave. There are technical reasons for this but I’m no scientist so I’ll leave the explanation as to why metal is a no-no to them. Basically, if you do use metal it can cause sparks inside the microwave and in more serious cases you might end up with an explosion on your hands! 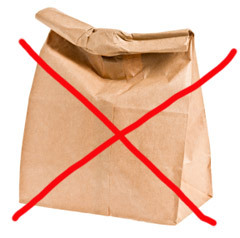 While there are special brown microwave bags that are safe to use (like microwave popcorn bags), the average brown paper bag is something you should never put in your microwave. The main reason for this is that intense heat can cause the bag to ignite and the last thing you need is a microwave that’s on fire! Because of the materials used for these paper bags, they will also emit toxic fumes that can get into the air around you, so you could be breathing something in that might affect your health. Instead, if you want to use bags, buy those that have been specifically designed for microwaves. If you need to cover the food you’re cooking, make sure you only use proper “microwave safe” cling film or other items that won’t cause an issue. You should also make sure that you don’t let cling film touch the food because it might get contaminated. Oddly enough (and this surprised me), you cannot turn grapes into raisins in your microwave. They will just simply turn into a ball of fire. 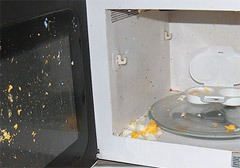 Eggs with the shell on are also something you should steer clear of when cooking in your microwave. The reason for this is pretty obvious but basically heat will build-up inside the shell and eventually attempt to escape (yet another mess to clean up). This is even the case with boiled eggs that have already been peeled. Dried hot peppers should never go in your microwave. There is a chemical called capsaicin in hot peppers which (and your mouth will tell you this if you’ve ever had one) is highly volatile. If you put them in your microwave they will explode! Vegetables are something else you should be careful about. Whilst many vegetables are microwave safe you should stick to those that contain plenty of water, and for other types poke a few holes in them so the heat has somewhere to escape. Other food items that will need a little “poke” are things like sausages, potatoes and hot dogs. Anything with a skin should have a few holes in it before you cook because this gives the steam somewhere to go. Boiling water is probably something a lot of us do in the microwave but again, you should be careful especially if you’re just getting used to a new unit. 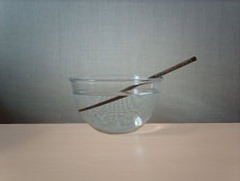 However, one little tip is to put a chopstick in the container which should prevent “over-boiling”. Marshmallows are a great treat at anytime of the year, but if you want them hot DO NOT put them in the microwave. Not only will they expand to well over twice their original size, the mushy treat inside will be like molten lava! These are just a few tips for you when thinking about what you shouldn’t put in your microwave but the real message is if you’re not sure check first!